Ringo heads out on a date with Tabuki. Episode 7 of Mawaru Penguin Drum is full of Ringo’s delusions. She is, after all a girl who has grabbed fate by the horns and is actively wrestling it to the ground. 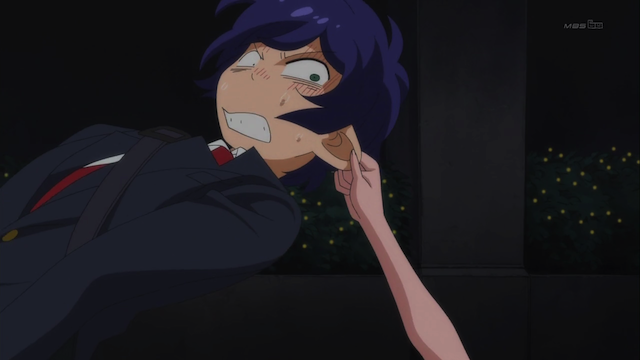 Unfortunately for Shouma, he seems to have gotten in the path as Ringo’s crazy train comes barreling through. Poor Shouma. This image is metaphorical for his life as depicted by the past several episodes. Ringo heads out on a date with Tabuki only to get upstaged repeatedly by her nemesis, Yuri Tokikago. As Ringo battles Yuri for Tabuki’s heart, Shouma becomes collateral damage. He is dragged along, and suffers indecencies. But all is for nought; Yuri publicly announces that she is to wed Tabuki. 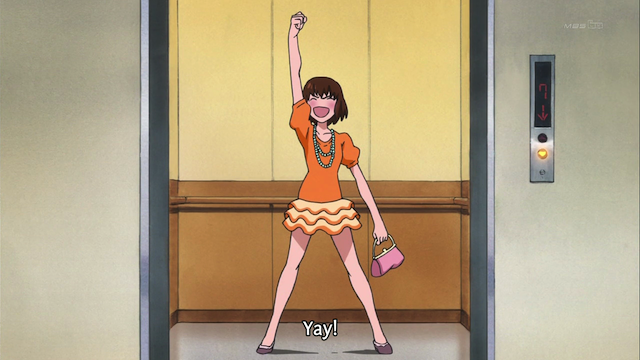 Thus the episode ends on a bit of a cliff-hanger, with Ringo, obsessed with her “Project M”, now revealed as the plan to bear his child (maternity), crawling into Tabuki’s room at night. Apparently she intends to take him by force, if necessary. Just one of the mysterious logos. But what really motivated me to write this week was this image, and reading a blog post at hellohelloanime. Penguin Drum is truly one of those anime that benefits by poking about the aniblogiverse. In this case, Nishimura writes about something I had not noticed: there have been TWO penguin logos shown. Kiga who is supplying Kanba with money is only one of the two. The other logo for “Ping Seven” was seen on the box in which the three penguins were delivered. 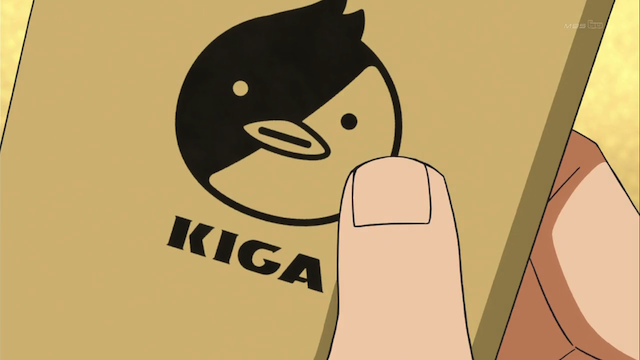 Furthermore, in the flashback scenes, Kanba’s dad was wearing a jacket with the Kiga logo on the back. Who are these mysterious organizations, and what do they want?